English stage actor Robert Donat had garnered acclaim playing opposite Charles Laughton in Alexander Korda’s The Private Life of Henry VIII, and was brought over to Hollywood to star in the first talkie version of Monte Cristo. This is the first of director Rowland Lee’s spate of swashbucklers, and he does an able job, supported by a stirring soundtrack from Alfred Newman. The story is necessarily streamlined from that of the lengthy novel, its European politics simplified for an American audience, and the plot pared down to its essence of triple revenge. It’s pretty tight, and there’s a desperate urgency to Edmond Dantes’s escape from the Château d’If that’s missing from the earlier silent versions. In due course Dantes finds the buried Spada treasure and utters Dumas’s immortal line, “The world is mine!” The film’s final hour is the clockwork accomplishment of his vengeance. Transformed by the Spada wealth and the Abbé Faria’s wisdom, Donat looks tremendous as the Count de Monte Cristo, silver-haired and rigid with purpose. Elissa Landi plays Dantes’s old love, Mercedes, and when she first meets the count after twenty years of believing Dantes dead, the scene is genuinely affecting. After that the count’s shocking revelations follow one upon the other, and it all ends as it should, with flashing swords and pistols at dawn. 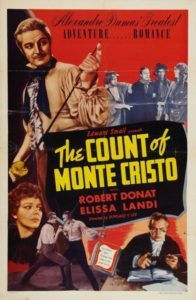 This was the definitive Count of Monte Cristo for a generation. After this film’s success, Donat was offered the lead in Captain Blood, but he didn’t like Hollywood, and went back to Britain to work with Alfred Hitchcock. (And the part of Peter Blood, of course, went to Errol Flynn.) Monte Cristo’s producer, Edward Small, went on to make eight more swashbucklers over the next fifteen years, mostly starring Louis Hayward, including two more Monte Cristo sequels.